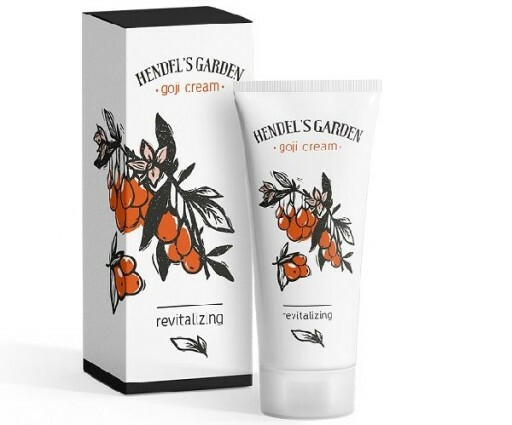 Hendel’s Garden Goji Cream is a nutritional cream with a strong antioxidant effect thanks to its perfect concentration of the extract of the Tibetan Goji fruit (Lycium barbarum – from organic crops, certified ECOCERT®). It is enriched with grapeseed oil, jojoba oil, and allantoin. The Hendel’s Garden Goji Cream moisturizes, creates healthy skin, and reduces the signs of aging. The Hendel’s Garden Goji Cream joins with the east and the coast with a rejuvenating and advanced anti-aging formula exclusively designed to diminish fine lines and wrinkles, stimulate collagen and elastin, and restore the delicate area around the eyes. This exclusive formula lifts, tightens, and firms fine lines and wrinkles. Goji Tibetan Berry, considered the Beauty Food in Asia and a powerful antioxidant, helps protect delicate skin and strengthens, affirms, and softens fine lines. The anti-aging properties of jojoba oil help to smooth, soften, and protect the delicate area under the eye, while restoring and rejuvenating the skin from the inside out. How to use Hendel’s Garden Goji Cream? Apply a small amount on a perfectly clean face and neck with gentle upward movements. Use in the morning or at night as a replenishing moisturizer, alone, or under makeup. HILAURONIC ACID: The most essential element of the structure of the epidermis. Stimulates the production of proteins responsible for the elasticity and strength of the skin. COLLAGEN: THE YOUTH’S POTENTIATOR: Prevents dehydration of the skin, maintains its structure. It helps to revive the cells and has a powerful lifting effect. AMARANTH OIL: Accelerates the regeneration of the skin; the “old” cells are replaced by the young ones, full of vitality. VITAMINS AND OLIGOELEMENTS: Necessary for the health and beauty of the skin. Effectively improves texture and prevents damage at the cellular level.